Church boats racing in Leksand: here a Siljan salute, or tossing the oars. Photo: Koos Termorshuizen. Koos Termorshuizen, chief editor of the Dutch rowing magazine Roei!, recently visited Sweden. He went up to the province of Dalarna (in English: Dalecarlia), which is in the middle of the country and known for the church boats. Here Koos gives the HTBS readers a little taste of what he saw. The Brudpiga Roddarklubb in Västanvik, Sweden, has about 300 members. Fifteen of them row boats like those racing at Henley Royal Regatta. Fifty members of the club row church boats. Among them is e.g. Lassi Karonen, who placed fourth in single sculls at the 2012 London Olympics. The epicenter for this particular kind of boat and racing in our sport is the town of Leksand at Lake Siljan. For centuries, large clinker-built boats have been used as the main transport means until the beginning of the 20th century, when steamboats and cars replaced them. 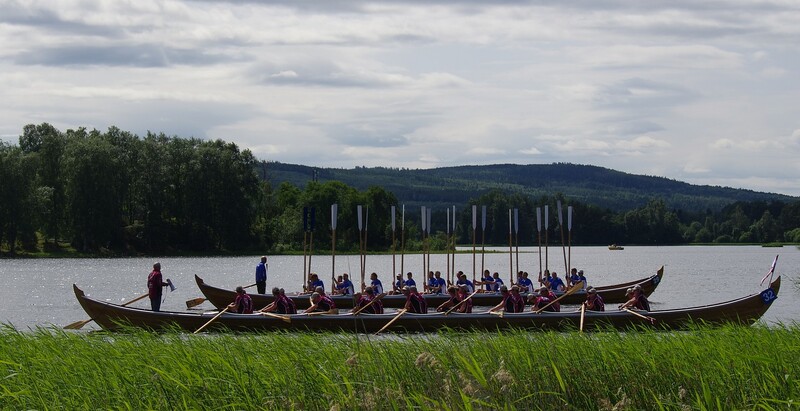 On Sundays, the church boats were used by the villagers from all around the lake to row to the church in Leksand. 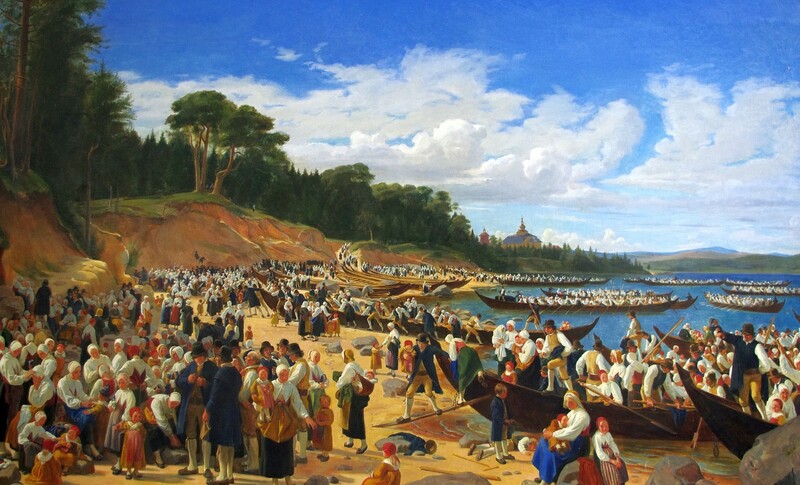 Wilhelm Marstrand’s painting from 1853, with the Leksand church in the background, is a fine illustration how it used to look when the villagers rowed to church. In 1936, when people saw the boats deteriorating, they started organising races in church boats in order to keep both the boats and the tradition alive. 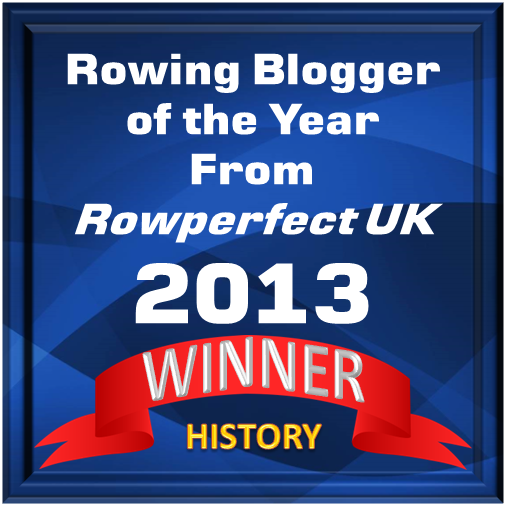 The boats were standardized: 20 rowers, ten on each side, boat length 18.5 metres, weight about 800 kilos. The rowing season for church boats is short: in the weeks around the longest day, Midsummer, the villages by the Siljan organise races. The final race is on the first Sunday of July in Leksand. Brudpiga owns two churc hboats, and last Sunday they won the Leksand 2650-metre race – as they have won all other races this year. Midsummer is a big event in the Nordic countries with a lot of music and dancing. 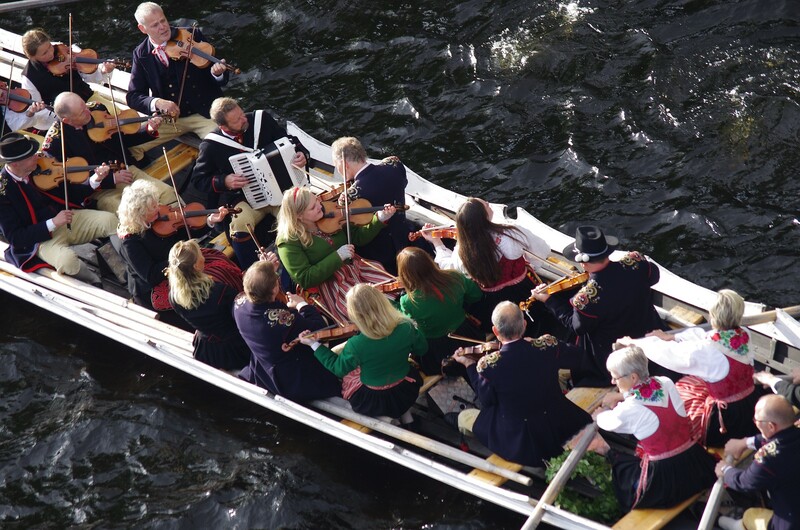 It is the church boats that are bringing the musicians in traditional folk customs to Leksand. Photo: Koos Termorshuizen. 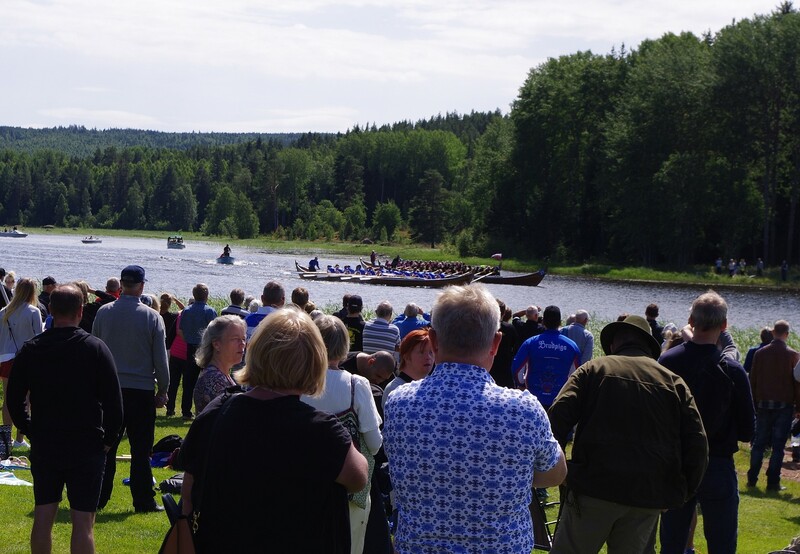 The church boats racing in Leksand always attracts large crowds. Photo: Koos Termorshuizen. How about the remainder of the 300 Brudpiga members? They spend their time cycling or cross country skiing, depending on the season.